And just like that, the “UFC Fight Night: Shogun vs. Henderson II” roster has been completed. The promotion confirmed the show’s entire nine-bout lineup Tuesday. Ginasio Nelio Dias in Natal, Brazil hosts the March 23 fiesta. 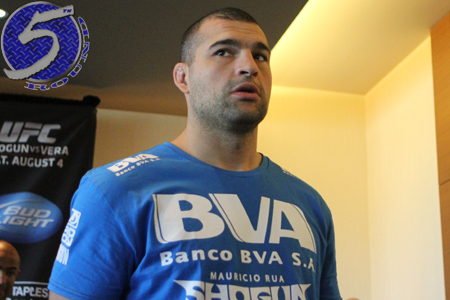 A light heavyweight rematch between former champion Mauricio “Shogun” Rua (pictured) and Dan Henderson headlines the gig. As it currently stands, middleweights Cezar Ferreira and C.B. Dollaway will serve as the co-main event. The entire card is expected to be made available live via UFC Fight Pass. However, no official announcement has been made so Fox Sports 1 or Fox Sports 2 are still possibilities.